There are a lot of treatment options available for eczema, but many people do not realize that you can avoid flare ups entirely with changes to your diet. While some flares may occur even with the right diet, eating certain foods while avoiding others can lessen the frequency of eczema flares. Follow these dietary restrictions to give yourself a higher level of comfort. Research has found that a healthy diet that includes these foods will help you stave off eczema flare ups. If you have allergies that contribute to your eczema flares, eating these foods may not eliminate your symptoms altogether. A healthy diet can, however, help you feel better and keep flares to a minimum. Fatty fish, such as salmon, is laced with omega 3 fatty acids, which have an anti-inflammatory effect. It is generally recommended for good health to get 250 mg of omega 3s per day. This can help reduce the effects of your eczema. There are also some foods that act as natural anti-inflammatories and antihistamines. These foods include apples, blueberries, cherries, broccoli, spinach, and kale. In general, focusing on a diet packed with fruits and vegetables will help reduce inflammation in the body. Probiotics can also help. These can be found in foods like sourdough bread, miso soup, and soft cheeses. You can also get probiotic supplements, and some yogurts are fortified with probiotics. If you aren’t sure if you have any of these food allergies, you should talk to your doctor about allergy testing. You could have a food allergy even if you do not present symptoms such as hives or difficulty breathing. 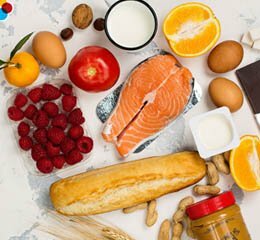 Through careful allergy testing, we can determine if food allergies exist that could be affecting your eczema. Contact us today for allergy testing in Florida. Your skin is red, irritated, and peeling, but why? You could be one of the millions of Americans dealing with a skin condition like eczema or psoriasis. Don’t worry though, clear skin isn’t out of your reach! It’s not always easy to distinguish between irritating skin conditions, but learning to recognize the differences and quickly seeking treatment from a qualified dermatologist are both vital steps on the path to clear and healthy skin. Psoriasis is a very common condition that causes a person’s immune system to instruct skin cells to duplicate and grow faster than they naturally should. This excess of skin cells prevents dead skin from falling off like it should. Instead, old, dead, and damaged skin cells accumulate on the skin and cause red, itchy blotches. Is Bacteria The Trick to Treating Eczema? Eczema has long been the enigma of the skin and allergy world. Those who suffer from eczema don’t always know why, and products and treatments don’t always deliver results. Until now! According to recent research by Dr. Ian Myles, it is possible to use the power of healthy, helpful bacteria living naturally on the skin to treat eczema. Here is everything you should know about this groundbreaking discovery. Eczema is considered an inflammatory skin condition that causes the skin to become dry, itchy, red, and even scaly. It occurs because the skin does not have the fats and oils needed to self-moisturize and sustain a protective barrier. Without that barrier, harmful bacteria can easily cause reactions in the skin that lead to the signature redness, cracking, and scaling. Could Your Pet Be Contributing to Your Child’s Eczema? It’s common to experience dry and itchy skin, especially during the winter months, but eczema is a skin condition on an entirely different level. Eczema presents itself in the form of red, scaly, and patchy skin that can even bleed and crust over in serious cases. It can impact anyone at any age, but children are the most common sufferers of eczema. Eczema is a common skin condition, but it’s also one that is challenging to treat. The good news is that you don’t have to let that red, scaly, patchy skin define your appearance. With the right treatment guided by a professional allergist, you can reduce the signs of your eczema and reclaim clear, healthy skin.